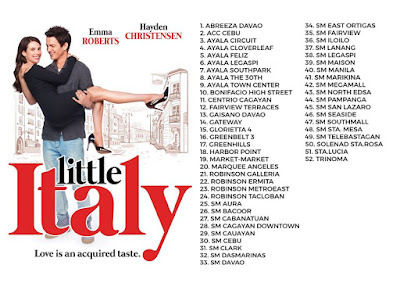 Go Asia Entertainment is proudly pleased to present their first film project, Little Italy, to distribute it for sreening in the Philippines starting October 3, 2018. 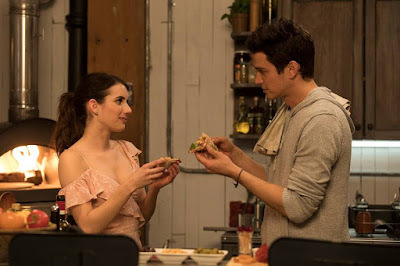 Little Film is directed by Donald Petrie (Miss Congeniality, How to Lose a Guy in 10 Days) feature film, LITTLE ITALY, completed principal photography on June 22, 2017 in Toronto, Ontario. The screenplay is written by Steven Galluccio (Mambo Italiano, Funky Town) and Vinay Virmani (Breakaway, Dr. Cabbie). 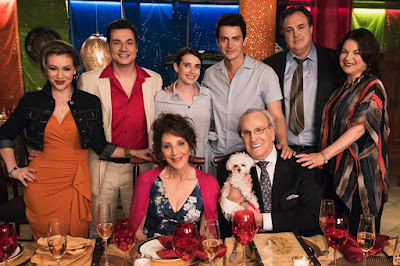 Principal cast includes Hayden Christensen (Star Wars, Jumper), Emma Roberts (Nerve, We're The Millers), Andrea Martin (Great News, SCTV), Alyssa Milano (Charmed, Who's The Boss), Danny Aiello (The Godfather, Do The Right Thing), Adam Ferrara (Rescue Me), Gary Basarba (Brooklyn South), Andrew Phung (Kim's Convenience), and Jane Seymour (Wedding Crashers, Dr. Quinn Medicine Woman). This is a story about a little place with a big heart – a community with deep roots that lives life loud and proud. "Little Italy is a romantic comedy with a really big heart. Its a story about a community that loves, laughs, fights and forgives. It reminds us that love knows no boundaries," says lead actor Hayden Christensen. "I've always been a huge fan of Donald's movies and when I heard he was directing this film, a throwback to movies I've always loved watching, I jumped at the chance to play this character," says lead actress Emma Roberts. "Love – Love of food, love of family and love that knows no barriers of age or gender," says director Donald Petrie. "No matter who you are, you're sure to laugh, cry and find a little bit of yourself in Little Italy." Little Italy is produced by the team of First Take Entertainment led by the Creative Producer Vinay Virmani. The team of Producers includes Pauline Dhillon and Ajay Virmani. 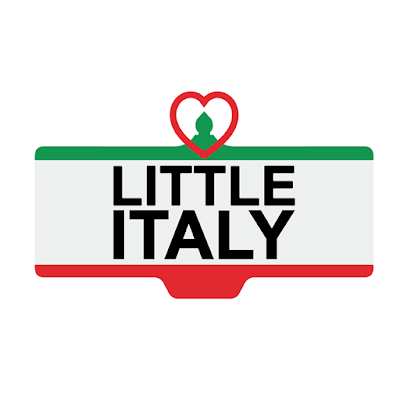 Executive producers of Little Italy are Fred Fuchs, Tiffany Kuzon, Patrick Roy and Christina Kubacki. 1999. Best friends SAL and VINCE pool their talents and secret family recipes to give Little Italy its most storied pizza. One day a terrible fight breaks out between the two. No one knows why. But Little Italy is never the same again and neither is its pizza. A wall now runs between the once fabled pizzeria. PIZZA NAPOLI is now divided into VINCE’S PIZZA – THE BEST and SAL’S PIZZA – IT’S BETTER. Present day. Nothing has changed. Sal and Vince spend more time trying to sabotage one another’s shops than focus on their own business. But not everyone wants war. 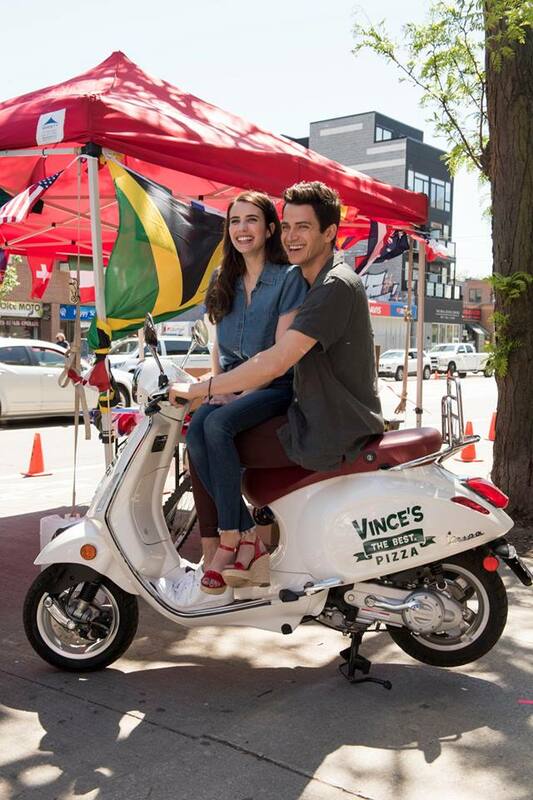 Love blossoms in little Italy’s cobblestoned piazzas between Sal’s daughter NIKKI and Vince’s son LEO. Nikki is now a Cordon Bleu chef freshly returned from London. She and Leo, a pizza chef who dreams of owning his own organic pizza place, rekindle their childhood crush right under their oblivious fathers’ eyes. Sal and Vince’s wives DORA and AMALIA are secretly best friends, but have to keep up the charade for their squabbling husbands’ sake. To complicate matters further, Sal’s mother FRANCA and Vince’s father CARLO are also carrying on a clandestine romance! When Franca and Carlo announce their wedding plans to their shocked sons, Nikki and Leo’s secret romance slips out in the open as well. A shocked Sal and Vince decide Little Italy is too small for the two of them. A wager is laid. “Team Sal” will face “Team Vince” in a pizza cookout and the loser will leave Little Italy for good. Sal and Vince succeed in pitting their children against each other, so Nikki and Leo are now also bitter rivals. Tempers are raging hotter than wood fired pizza ovens. Who will the winner be? Team Sal or Team Vince? And what of the couples? Will their love become the victim or emerge victorious in this ridiculously epic food feud? Production started on Little Italy in Toronto, Ontario (Canada) on May 18th, 2017. You couldn’t shoot a movie entitled "Little Italy" unless you shot at least part of it in Toronto’s original and historic district of the same name. So, over the next 27 days, production would shoot all over downtown Toronto with a special emphasis on shooting in Toronto’s Little Italy. Production made use of numerous homes, streets and locations in the neighborhood to the delight of children and families. On one occasion, when production was shooting on Clinton Street one Saturday evening, several children (and adults) were overheard remarking who cool it was to have “Anakin Skywalker” a.k.a. Hayden Christensen on the corner of their street! Indeed, production took all of the rich character and history of Toronto’s Little Italy and proudly displayed it in Little Italy. A huge portion of Little Italy takes place in a pizzeria and thankfully the producers decided to re-create a pizzeria in Little Italy instead of on a soundstage in a distant warehouse. Pizza Napoli and then Vince’s Pizzeria and Sal’s Pizzeria sets where re-created in a vacant storefront right on College Street. Production did such an amazing job recreating an old school pizzeria that on a few occasions, confused pedestrians thought it was an actual pizzeria. And it was great to see Danny Aiello once again behind the counter at a pizzeria as it harkens back to his Oscar-nominated performance as “Sal” in Spike Lee’s ground-breaking Do the Right Thing. The production was able to access many iconic locations. The local Starbucks for one, provided a critical and comical setting for the romance of grandparents, Carlo (Danny Aiello) and Franca (Andrea Martin). The Little Italy team would like to extend a very special thanks to Starbucks for generously offering us one of their busiest locations along with the use of their globally popular brand name. Another location that was written into the script as one of the old couple’s covert meeting points was the Metropolitan United Church in the downtown core. The largest church in downtown Toronto, Metropolitan United has a long history of worship dating back to 1872. Outside of Little Italy, the producers also made use of several amazing locations including the historic Distillery District which was used re-create the famous Chin Radio Little Italy street festival. The Distillery District, which is located 10 minutes east of downtown core, proved to be the perfect location with its cobblestoned streets giving the scenes an authentic feel. Another iconic location to be utilized in Little Italy was Christie Pits, which spans a full city block, for the hilarious soccer scenes between (Nikki) Emma Roberts and (Leo) Hayden Christensen. The location serves double duty for their childhood soccer games and then their present rivalry which takes place during a heavy rain shower. Equally amazing is that scenes were being shot in a small portion of the park while many Torontonians were out enjoying the splendor of their urban oasis. Shooting in Toronto had many benefits including landing Hayden Christensen for the coveted role of “Leo.” While Hayden was born in Vancouver, British Columbia, he spent his formative years just north of Toronto and still has plenty of family there. Hayden relished the opportunity to work so close to home again (the last time was Jumper in 2008). In fact, while shooting scenes at the Distillery District, Hayden’s family all came by to visit. Director Donald Petrie is best known for directing many hit comedies including Grumpy Old Men, Miss Congeniality, the fan favourite, Mystic Pizza and now, two generations of Roberts women. In was in Mystic Pizza that Petrie directed a young Julia Roberts who is Emma Roberts’ aunt. 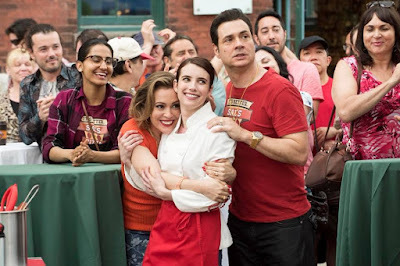 As Emma and her on-screen family in Little Italy also work in a pizzeria, Petrie decided to pay homage to Mystic Pizza and Julia Roberts by having Emma wear a replicate t-shirt (“A Slice of Heaven”) in Little Italy that Julia wore in Mystic Pizza. Emma relished the opportunity to pay homage to her Aunt Julia and the t-shirt was a coveted shot by the many paparazzi on the edge of set. As one would image, the most important props in movie set in a pizzeria are the pies themselves. For the many scenes that involved pizza, the props department was close by making the pizza. For a scene that involved several takes, it was not uncommon to have 10 pies made just to looks like they just came out of the oven. And once the pies played their scene, they were passed along to cast and crew to eat. Needless to say, few were left hungry on these days. 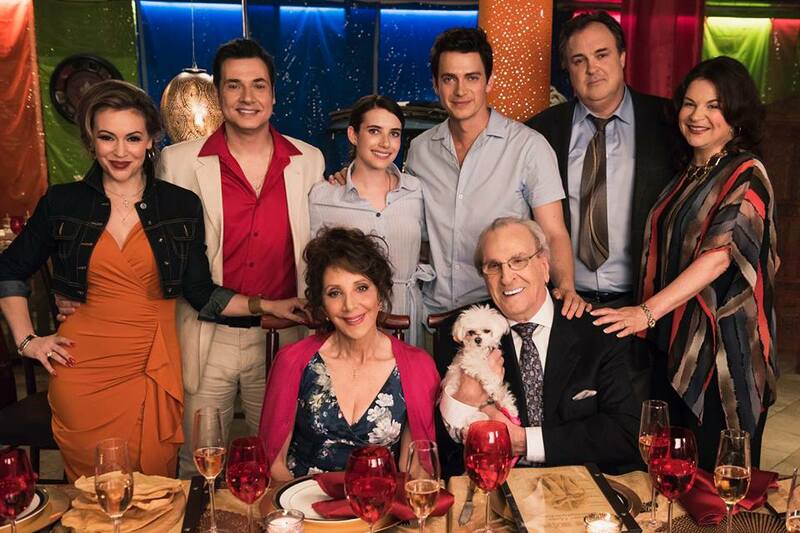 Much like an extended Italian family, there was quite family feeling on-set. Starting with lead creative producer Vinay Virmani, his dad producer and entrepreneur Ajay Virmani, all who visited set remarked how pleasant and enjoyable it was. This family feeling extended to cast. Visiting cast members were taken under the wings of local actors and shown the many offerings that Toronto had to offer. And the producers had many of their friends casually show up. 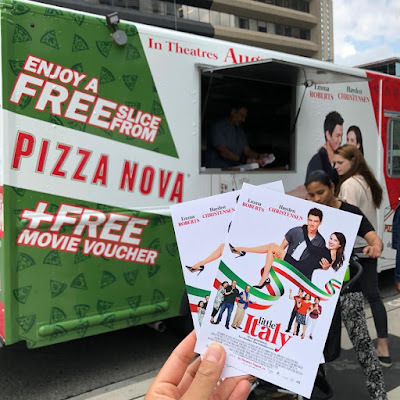 One-day, Toronto Raptor point guard Kyle Lowry arrived at the pizzeria set on College Street and nearly caused a riot with a crush of fans plus cast and crew wanting to meet him. On another occasion, Toronto Blue Jays pitcher Marcus Stroman came by to lend his support to Vinay. Once again, he was mobbed by fans. Not only did athletes enjoy visiting set but Little Italy had politicians visiting, like the Ontario's Minister of Culture, Tourism and Sport, Eleanor McMahon. A huge film buff and close friend of Virmani’s, Minister McMahon came by and spent the better part of an afternoon and evening meeting cast, crew and viewing action. Fresh off the oven, LITTLE ITALY is generously topped with ingredients that everyone enjoys – love of food, love of family, and love of one another. 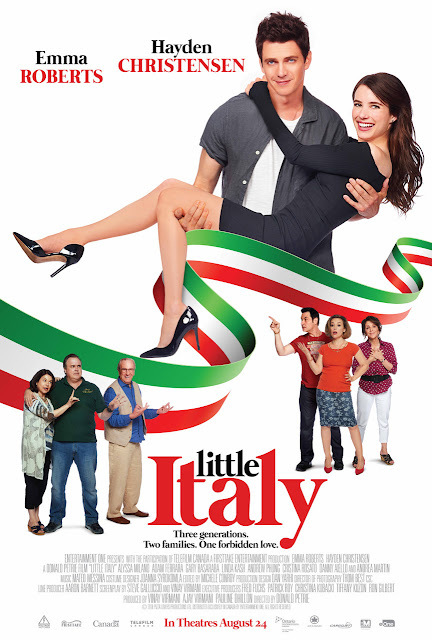 LITTLE ITALY features multiple love stories involving couples of different generations. But above all, it’s a story about coming home to what you love and who you love. An impressive ensemble cast of vivid, colourful characters helps bring this story to life with a series of comedic punches and situations that line up one after the other, with little rest for the viewer. This crowd-pleasing story is an inspired mix of memorable movies like Chef, My Big Fat Greek Wedding, Love Actually, and Big Night. It tells us the tale of two loud Italian families who wear their hearts on their sleeves and cook with fierce pride. To them, the love of food and family isn’t just an important thing – it’s everything! Indeed, LITTLE ITALY would not be complete without mention of food – more specifically, pizza. It is said a recipe has no soul, and it is for us to bring soul to the recipe. So viewers can get ready for a visual feast, Italian-style that will leave them hungry and craving for more. If there’s one thing that can make absolutely everybody happy, it’s pizza. And you’d agree, a movie about the subject should come extremely close.